Because we get so much snow in the Great White North, the holiday gods deemed fit to give us Canucks another day off, following Christmas. Alas, Boxing Day was born! Well... it seems like a good enough reason to me! Millions of Canadians blearily trudge out in the early, frigid light of December 26 to stand in line for door-crasher Boxing Day sales. Me, I'll be tucked warmly in bed with sugar plums still dancing in my head. I've done enough pre-Christmas shopping, thanks and nothing, NOTHING will entice me to get up at 5am to venture out in the cold to buy more crap. *Ahem*.... Boxing Day has nothing to do with fighting, boxing gloves or the like. Nor is it in regard to tossing out all the boxes from opened presents from the day before. 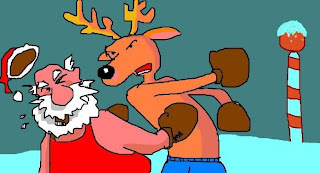 For an explanation on what Boxing Day *really* is.... click here.